Ramada’s Toys for Tots 2015 – Best Yet! 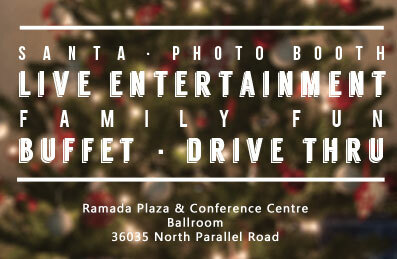 The 3rd Annual Ramada’s Toys for Tots Christmas Breakfast is receiving rave reviews and we couldn’t be more thankful! A record 1,300 people attended, more than $26,000 raised and receiving over 1,300 toys. The Abbotsford Food Bank is excited to announce the return of a new-found Christmas tradition, the 3rd Annual Toys for Tots Christmas Breakfast presented by the Ramada Plaza & Conference Centre and Envision Financial, on November 27th from 6am – 9:30 am. The public is once again invited to drop by with a new toy or monetary donation and stay for the free buffet breakfast, kids’ activities, and fantastic live local entertainment. Once again the event falls on an Abbotsford School District Pro D day, parents love bringing their children. The event is a great opportunity to talk about the true spirit of Christmas with our children. It’s better to give than receive! For those who don’t have time to come in, there will be a drive-thru in the parking lot to drop off donations and enjoy a free coffee and pastry. Toys for tots Raises More! Our hearts are full of gratitude for everyone that came out to the 2nd Annual, Ramada’s Toys for Tots Christmas Breakfast! The event was a great success! An estimated 800 people attended, raising $14,000 in financial donations and over 1,100 toys were collected at the event.. The success of this event would not have been possible without the investment from our community. We would like to thank first and foremost, Ramada Plaza and Conference Centre for their desire to create a wonderful event. The conference centre was beautifully decorated, the food was amazing, and your volunteer staff was so friendly and helpful. Thank you to Envision Financial for your investment in our community through the Full Cupboard program. Your enthusiastic support and promotion of the event was invaluable. Your volunteers were so willing to lend a hand, they even stood in the pouring rain without complaint!